Many shoppers hit the stores this Friday to take part in the many bargains that were being included in the Black Friday extravaganza. Retailers were offering “door buster” deals and other promotions that caught the eyes of millions of shoppers in store and online. Although many shoppers hit the store, average spending per person was down to $290 from $300 in 2015. Matt Shay, the chief executive of the National Retail Federation (NRF), attributed the decline in spending to just how deep and broad the discounts were over the four-day weekend. Retailers have also been spreading out their Black Friday deals out over a longer stretch, which resulted in consumers already having access to good deals before Black Friday started. JC Penney and Macy’s are among the many stores that have been offering promotions for a while. 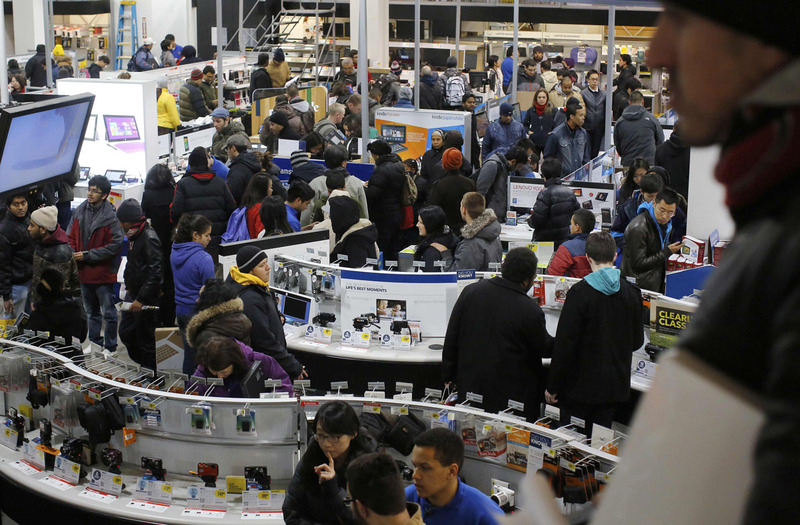 Many shoppers had decided to avoid long lines and crowded stores, which resulted to more online shopping. Online shopping during the holiday weekend is a multi-billion-dollar business, according to Adobe, which tracks data from online purchases across the 100 biggest retailers. Shoppers spent $1.9 billion online on Thanksgiving Day and another $3.3 billion on Friday, according to Adobe. In 2015, approximately $103 million shopped online while $102 million bought in-stores. This year, the Internet had a clear advantage: More than $108 million purchased electronically, while only $99.1 million bought in stores. Sales generated from smartphones and other mobile devices alone were expected to top $1 billion for the first time ever. 60% of online orders at stores such as Walmart and Target came from mobile devices alone. More than 50% of Wal-Mart’s Black Friday promotions, both online and stores, were on consumer electronics, compared with 33% at Amazon and 20% at Target, according researcher Clavis Insight. Over one third of consumer said 100% of their purchases were on sale, according to NRF spokeswoman Ana Smith. “Consumers are pushing retailers toward deals and bargain,” she told the Daily News. “Shoppers don’t ever buy at full price, unless it’s a necessity.” Data analytics firm RetailNext said it the entire four-day weekend to account for 18-21 percent of overall holiday revenue. Black Friday has traditionally been the biggest shopping day of the year for traditional retailers but, its importance has gone down over the years, due to retailers offering greater convenience through discounts online year-round. NRF found that only 9% of consumers have finished their holiday shopping, down from 11% last year. The group forecasts 122 million consumers plan to shop on Cyber Monday, up from 121 million a year ago. Previous Previous post: 2016-17 College Football Playoff: Who’s in, Who’s Out?